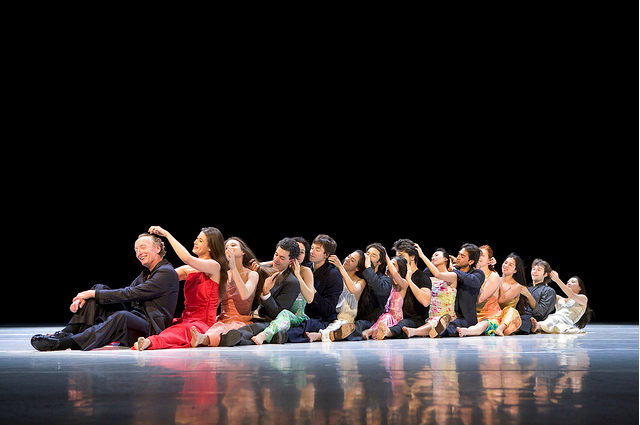 Went to see Pina Bausch's last piece "… como el musguito en la piedra, ay si, si, si …” (Like moss on a stone) at the BAM last night. The theme revolved around the Chilean landscape, deserts, folk songs and the bustling city of Santiago. In contrast to her previous Vollmond's dark and wet landscape, the scene was light and dry, with a floor that would crack open like parched earth as women in vibrant colors danced on it. It was filled with her usual absurd theatre and humor, followed by solo pieces of pure emotional expression. At times it felt a bit erratic and void of the driving energy of her earlier pieces. But there was a beauty, longing and a sadness, interactions of meeting and being pulled apart, ending as it began, one dancer- alone on stage. I couldn't help but wonder, as this being her last work, if this is how it ends, the way it begins. And all that was in-between, the joys, humor, absurdness, sadness, love and terror, come and go in vibrant flashes. Left with nothing and everything.